If you don’t have one, run out and get one. What in the world am I talking about? A cast iron skillet. It is a kitchen must have. A basic. But don’t go to an expensive kitchen store to get one. Go to your local hardware store. You will find the best brand at your good old hardware store-Lodge. As I love to cook, I have a couple cast iron skillets. One of my favorites has ridges to sear a lovely tenderloin, grill some delicious hamburgers. or make a creamy warm panini. There are a zillion ways to use your cast iron skillet. If you keep it seasoned, it will also become something you can hand down through the generations. Here is one of my well seasoned cast iron skillets. Wash the cookware with hot, soapy water. Apply melted solid vegetable shortening (or cooking oil of your choice) to the cookware inside and out. Too much oil will result in a sticky finish so keep your application thin. Set oven temperature to 350 – 400 degrees F.
Place cookware upside down on the top rack of the oven to prevent pooling. Bake the cookware for at least one hour. After the hour, turn the oven off and let the cookware cool in the oven. When I use and wash my skillet, I dry it not with a towel but over low heat on a burner. I recently used this skillet to sear some zucchini for dinner. I simply split the zucchini lengthwise, and sprinkled it with salt, pepper, and olive oil. Next, I got my cast iron skillet good and hot on the stove. Then I seared the zucchini halves with the flesh side down first. I seared it much like a piece of meat. After searing one side, I turned it over and seared the second side. I flipped the fleshy side of the zucchini up and put a little freshly served parmesan on top. Ooh! So yummy! This recipe is a keeper. It was super quick, hardly any ingredients, and so very tasty! It was beautiful on the plate as well. So look for variety not only in your food, but in ways to prepare them. This is the story of an easy, savory, nutritious one pot dinner. Why one pot? A simple reason: it was a busy weeknight and I did not want a lot of dishes. Keeping a well stocked pantry and freezer is key to quick easy meals. I also like to keep fresh produce on hand so I can pull meals together without those pesky after work visits to the grocery store. For this dinner, I started out with broccoli and cauliflower in a bowl. Then I tossed it with some olive oil, salt and pepper. I put it on a parchement lined baking sheet (remember…few dishes!) and roasted that for 20 minutes at 400 degrees. Then I put some sweet little cherry and grape tomatoes into a pot, again with a little olive oil, salt and pepper. I then let that simmer a bit. These cook down to a creamy delight. I also added a clove of chopped garlic. As that was simmering, I chopped up some fresh spinach and arugula. When the tomatoes were thick and bubbly, I added the greens. I like to mix arugula into my spinach because of the sharp peppery flavor it adds. I gave all of that a good stir. Now dinner was really smelling delicious. Savory fragrance was wafting through the house, and I was getting really hungry! I took the veggies out of the oven when they were a little brown on the edges, and let them rest not the counter (on a hot pad) for a few minutes. Next it was time to add the pasta. Angel hair pasta was going to be my pasta of choice because of its short cook time. I wrapped the pasta up in a clean dish towel, then ran the towel over the edge of the counter. This broke the pasta up efficiently and neatly. Then I added chicken broth to the tomato mixture. After that, in went the pasta. It was that simple. Again, a couple of quick stirs and I let this cook on medium heat. I then went to pour a glass of wine to accompany this delicious dinner. When the pasta was al dente (firm to the bite) I was ready to complete the meal. I added the roasted vegetables along with shrimp as the protein. The shrimp was raw, and it only took about 3 minutes for them to cook-any longer and they would become rubbery. And Voila! Dinner was ready. It was a complete meal in a bowl. I grated some fresh parmesan cheese on top, grabbed my glass of wine, and enjoyed a healthy weeknight meal. And my one pot meal left me with very few after dinner dishes. This meal is customizable. Don’t like cauliflower? Try zucchini. Shrimp isn’t your thing? Add some leftover cooked chicken. Want a more robust flavor? Add red pepper flakes and a pinch of cayenne pepper. Want a vegetarian meal? Use vegetable broth and leave out the shrimp. Craving an italian twist? Toss in some fresh parsley and basil. The possibilities are endless-but the after dinner dishes aren’t! I am always looking for something new with my side dishes. At meals, I like to feature more protein, veggies, and fruits than starches. Oh sure, starches are super yummy, but I tend to opt for fresher options. Since i enjoy cooking, I also like to keep up with food trends and techniques. That said, I work full-time, am a mom, and have a pretty packed lifestyle. Time is my most valuable commodity. I usually save my big new cooking adventures for weekends when I have more time to tinker in the kitchen. Sometimes I luck out and trying something new can be added into my weeknight “quick cooking” repertoire. Which is exactly what happened recently. I had a gift card for a cookware store from my sweet sister in law Kathy. What fun! Going into a kitchen store, for me, is delightful and indulgant. But even with a gift card I look for the biggest bang for my buck. In a kitchen store, that means that I would not invest in a “single use” kitchen gadget. What I mean by that is if a kitchen tool only has one use, it has no place in my kitchen. Unitl now….. I had seen the new trend with sprializing zucchini and squash. “Zucchetti” was the clever moniker, and this new technique for zucchini resembled pasta like spaghetti and lasagna noodles. So naturally I was drawn to this cool new kitchen tool, and sought it out gift card in hand. Bingo! I found one and couldnt wait to get home and try it. This gadget was a snap to work from the get go. I spiralized large and small width “Zucchetti”. I sauteed tomatoes to pair with it, and it turned out so well it is now on the dinner table (and lunch leftovers at the office!) quite often. Let me show you what I did. I placed some freshly washed grape tomatoes into a small saucepan with a bit of olive oil, and let that simmer over a low heat for about 20 minutes. The tomatoes got saucy, fragrant, and creamy. After that, I simply sautéed the spiraled squash with a little olive oil, salt and pepper. I then combined the two, and voila! I finished it off with some fresh parsley and basil from my summer garden. With a bit of freshly grated parmesan cheese it was a complete, and completely delicious, side dish. Zuchetti has become so much more than a simple side dish this summer. I have used this with marinara sauce, a bright lemony shrimp sauce, and other pasta sauces using zuchetti instead of pasta noodles. Whether using this as a side dish or a feature in the center of the plate item, this is a tasty replacement for starchy rice or pasta. So even though I purchased a kitchen gadget that had basically one function, the flexibility of what can be done with the spriralized zucchini is endless. Now my zuchetti is a mainstay for light and tasty meals. What can you do with it? I really like vegetables. Even more than fruit. Eating seasonally and taking advantage of farm fresh vegetables all year long not only provides great flavor and variety, but eating seasonally is budget friendly. My kids and I are adventurous when it comes to food, so I am challenged to find new ways to cook veggies. Since it is winter, root vegetables have been the staple lately. Luckily, my family enjoys carrots, potatoes, squash,beets…all the delicious colorful winter vegetables. Did I say all? Um, I meant most. My kids aren’t crazy about one winter vegetable…brussel sprouts. My kids tend to delight in normal kid stuff like, well, farts. Brussel sprouts, closely related to cabbage, are notoriously gas producing. Shouldn’t that be my number one selling point in adding brussel sprouts to our dinner repertoire? I mean, what could be more fun than that for my kids….seriously. With their competitive nature, I see this as a win win food offering, if you catch my drift (waft, hang time…). And that’s how I tried to sell it to my kids. They know enough to know what a cruciferous vegetable is, and what that produces. Slow roasted fresh brussel sprouts gently browning in the oven smell, well, cabbage like. Rats. That wasn’t going to sell my kids on these delicious sprouts. Of course my mouth is watering, but the kids are scrunching their nose up. So in the interest of family peace, I now reserve brussel spouts for when I dine at a restaurant. So I took the sprouts out of the family dinner rotation, but continue on a quest for a fresh seasonal change. Still wanting variety, I reverted back to another inexpensive vegetable…zucchini. I like to roast these with olive oil and balsamic vinegar, with perhaps a few shreds of fresh parmesan. But on this particular night, I was pinched for time and looking for a quick veggie option. I still used zucchini, but took it in a super quick and easy direction. 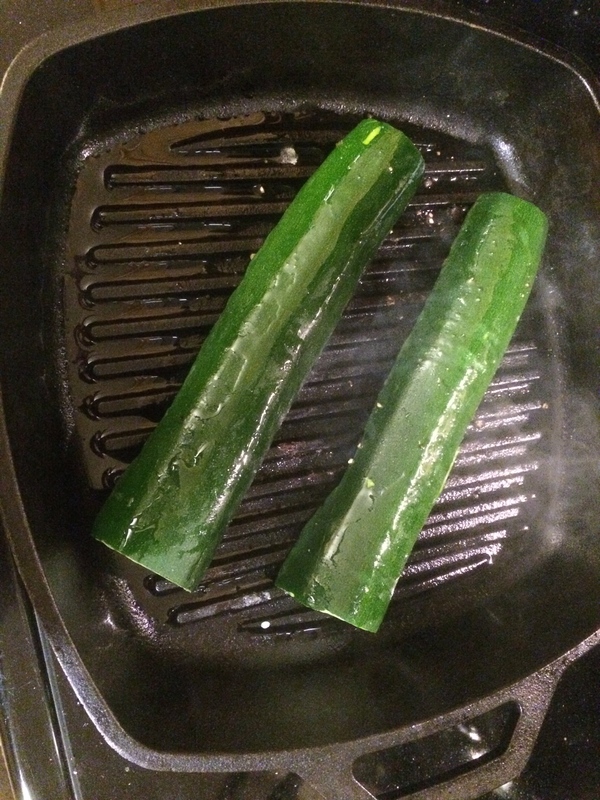 Splitting the zucchini down the middle, I then pulled my cast iron grill pan out and heated it up. I drizzled with zucchini with olive oil, and onto the grill pan it went. I seared it much like a piece of meat, not quite knowing how it would end up. After searing one side, I turned it over and seared the second side. I then put a bit of fresh parmesan cheese on top. The result was fantastic. Grilled zucchini in my (very inexpensive) cast iron grill pan. It was sizzling and searing. Yum! 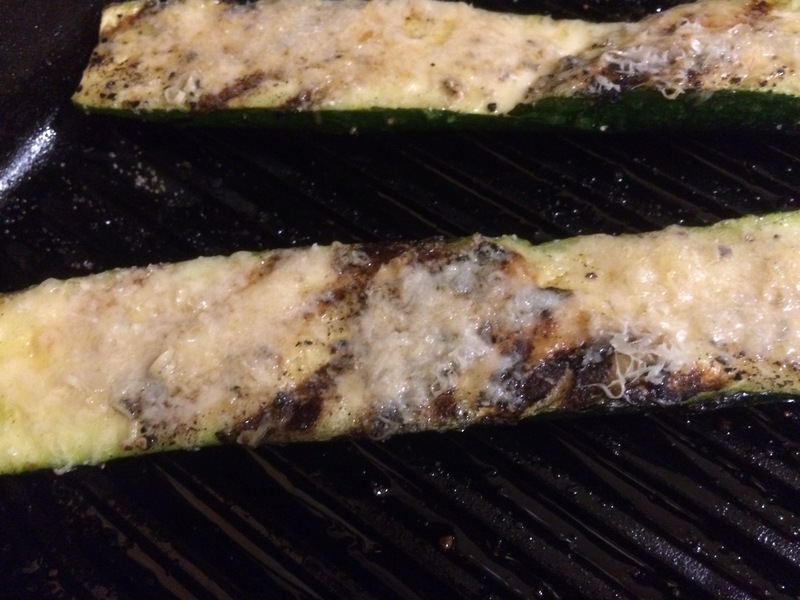 I flipped the fleshy side of the zucchini up and put a little freshly served parmesan on top. Ooh! So good! This is a keeper. It was super quick, hardly any ingredients, and oh so tasty! It was beautiful on the plate as well. So look for variety not only in your food, but in ways to prepare them. Oh, and you may want to take a page out of my book and order your brussel sprouts out at your favorite place Saturday night! So it’s the beginning of the year, and the season of resolutions. This is the time many folks decide to make healthy lifestyle changes. People at work are buzzing about losing weight, eating better, detox potions, and avoiding fast food. And, of course, I am no different. I do not make new years resolutions. I do, however, reflect on making positive changes in the new year. I too have been making an effort to eat a little healthier since ringing in the new year. Getting kind of bored with my regular “go to” recipes, I have tried to energize my normal recipe repertoire by trying to put fresh new combinations together. The other day I came up with a real winner. I made a super healthy quinoa salad. One day I took it for lunch at work. Another day I had it in the morning after my workout for a healthy protein boost. I do not limit my meals with traditional labels. If I feel like chicken for breakfast, I eat that. A bowl of cereal for dinner? Sure. Why not. So I enjoyed my quinoa all day. And it was delicious. 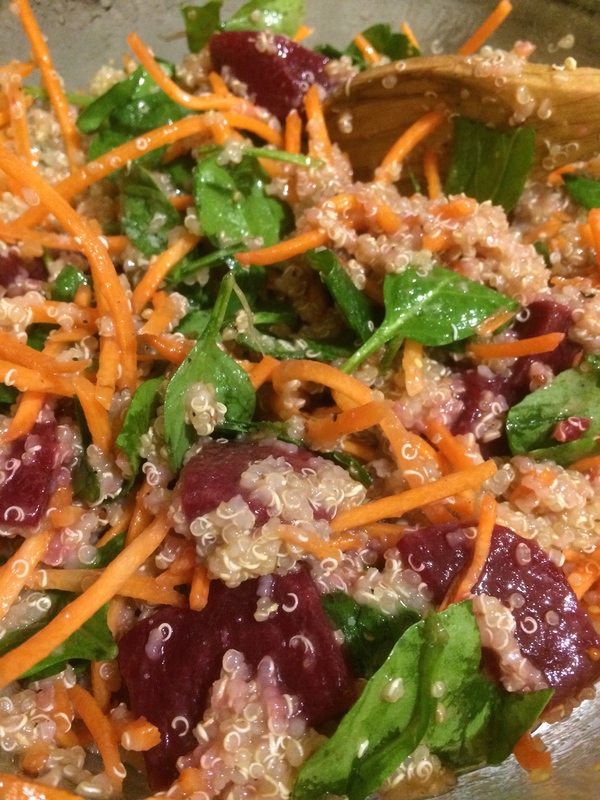 Simple fresh healthy quinoa salad! Yum! How did I make it? I had about 2 cups of leftover quinoa, a handful of shredded carrots, a green onion, a half bag of spinach, and homemade vinaigrette in the fridge. I tossed it together with a can of rinsed canned beets and Voila! A healthful flexible meal packed with protein and veggies. It had a nice crunch, great flavor, and a colorful appearance. Vinaigrettes are easy to make and even easier to customize to certain tastes. Want to try one? Start with this. Mix all ingredients and stir vigorously with a fork. Use to dress vegetables or your favorite salad. Yes, it’s that simple. I customize this recipe by using different vinegars and different mustards. Some times I use honey instead of sugar. If I am in a crazy mood I will add some red pepper flakes to heat things up a bit. So anyway, this is the vinaigrette that I added to my quinoa salad. Simple dimple. And so good. So as 2015 rolls on, I hope to make some more fresh and healthful dishes. No resolutions…just a positive change or two. Ok..again my Leo comes out…even in my cooking. An August birthday makes me a Leo, and I must admit, I am a lover of the sun. Summer sunshine means amazing herbs springing to life in my garden. I love them all, but my favorite of the summer herbs has got to be basil. I wash my hands before I pick the delicate leaves so I can allow the delicious scent to linger on my fingers for a few extra minutes. After first admiring my herbs, I pick some basal, close my eyes, bring my fingers close to my face and breathe deep. Inhaling this fresh basil is simply a culinary delight. It plays a starring role in many of my summer recipes. Everyone has basil around in the summer, and there are a million ways to use it, from simple bruschetta to complicated sauces. Summer bruschetta with fresh tomatoes and basil is as refreshing as a popsicle! Mix diced fresh tomatoes with freshly cut basil and goat cheese. Douse this with a bit of olive oil and vinegar. Drop a spoonful on some crusty bread and voila! Instant delish! My favorite thing to make with basil is fresh pesto. It takes moments to prepare and can be used in many different ways. Pesto can be liberally poured over pasta making a delicious side dish. It can be brushed onto fish, adding beautiful color and flavor to either delicate or hearty fish. I have doused chicken with pesto, adding flair to an otherwise bland weeknight dinner. Pesto can also be spread onto a sandwich as a savory condiment. I love the freedom to use my flavor packed pesto on most everything! It is simple and makes me look like a rock star in the kitchen at times. Who wouldn’t love that? Pesto is very forgiving too. I have adjusted or substituted ingredients without having to sacrifice flavor. I will pass along my pesto recipe and let you have some fun with it too! It is a crowd pleaser, so make plenty. Bon appetite! FYI- I have tried using toasted pine nuts as well as roasted garlic and it did not make a notable difference in taste. I have also substituted walnuts for pine nuts, and the flavor was great. I have used both the parmesan cheese in the green can as well as fresh parmesan cheese, and fresh makes a difference. Use freshly grated parmesan if you can, but if you only have the green can on hand, go for it! I usually add a little more olive oil if I am putting this on pasta. If you are using dried herbs in a pinch, you also may want to increase the olive oil. Go ahead! Play with this recipe! Have fun and enjoy the amazing flavors! And don’t forget to freeze some rouse later.